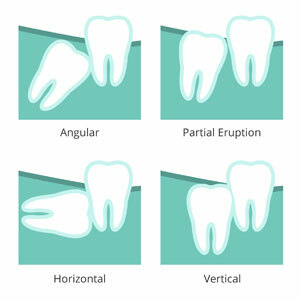 Wisdom teeth usually begin developing in the teenage years and may continue into a person’s late 20s. This third set of molars may never cause any problems, or could require removal due to complications. Removing your wisdom teeth may also be an important step in periodontal therapy or orthodontic treatments. If removal is necessary, we will discuss a variety of sedation choices to make the experience as comfortable as possible. For more information, schedule an exam with us to find out more about your wisdom teeth.